Travel hassle-free with free transfers to and from various locations in Bali! Cozy and great, will come again next time. Take a break from exploring the beautiful island of Bali, and relax on an indulgent spa session at Seminyak. Conveniently located at Sunset Road Seminyak, Lluvia Spa is one of the best spas in Bali, and has since been recognized for its excellent treatments and hospitality. Choose among a range of packages depending on your needs: Aromatherapy Body Massage, Traditional Lulur Spa, Massage Passion Package, and Pleasure Package. Enjoy an aromatic body scrub, explore traditional healing methods, or go in for a full body treatment. Then enjoy a calming complimentary drink after your spa session. Leave your everyday worries behind and rejuvenate from head to toe! 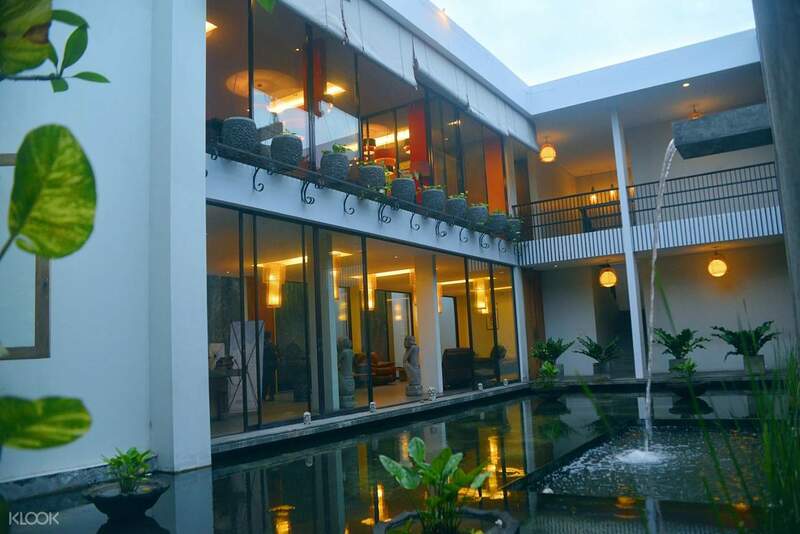 Enjoy convenient round trip transfers between your hotel and the spa in Seminyak! Spa was superb. Pick up and drop facility was on time. Me and my mom thoroughly enjoyed the massage and their service. They also provided us with refreshments. Spa was neat and clean. Spa was superb. Pick up and drop facility was on time. Me and my mom thoroughly enjoyed the massage and their service. They also provided us with refreshments. Spa was neat and clean. The pick up was on-time, the massage was great, the therapists are great as well. It was a great way to end our trip. The pick up was on-time, the massage was great, the therapists are great as well. It was a great way to end our trip. It is convenient because pickup and drop-off service is included. This is perfect for couples. They can have romantic milk bath with flower petals together. I met a very skilful massage therapist but my partner did not. His massage therapist (english name starts with A, Axxxx, who tends to be in heaven) did not do the massage seriously, maybe she thought her customer was asleep. But even after request, her massage was still not strong enough. We had the 4hour booking and it was kinda wasteful for my partner because the massage lasted for 90mins and plus some more minutes for the body scrub, and his overall experience was poor. Meanwhile, i still enjoy the spa. It is convenient because pickup and drop-off service is included. This is perfect for couples. They can have romantic milk bath with flower petals together. I met a very skilful massage therapist but my partner did not. His massage therapist (english name starts with A, Axxxx, who tends to be in heaven) did not do the massage seriously, maybe she thought her customer was asleep. But even after request, her massage was still not strong enough. We had the 4hour booking and it was kinda wasteful for my partner because the massage lasted for 90mins and plus some more minutes for the body scrub, and his overall experience was poor. Meanwhile, i still enjoy the spa. Very good service & the staff there are all very friendly. They could fulfill our request for 2 separate rooms for 2 ladies. Free car transfer & the ginger tea/ biscuits were tasty. Lovely experience. Value for money - we tried 120 mins body massage. Would recommend to everyone. Very good service & the staff there are all very friendly. They could fulfill our request for 2 separate rooms for 2 ladies. Free car transfer & the ginger tea/ biscuits were tasty. Lovely experience. Value for money - we tried 120 mins body massage. Would recommend to everyone. The staff would message a few days before to confirm the reservation. The pick up staffs were punctual, though the vehicle was run down and its air-con was not working. The masseur was attentive as well. The staff would message a few days before to confirm the reservation. The pick up staffs were punctual, though the vehicle was run down and its air-con was not working. The masseur was attentive as well. Transport came on time. Staff very friendly all around. Massage therapists were good. Klook deal was half price to what’s listed so it was very good value. Transport came on time. Staff very friendly all around. Massage therapists were good. Klook deal was half price to what’s listed so it was very good value. Really accommodating staff. Beautiuful ambience. You definitely feel pampered. Super worth your money. Definitelt a must try when you visit Bali! Really accommodating staff. Beautiuful ambience. You definitely feel pampered. Super worth your money. Definitelt a must try when you visit Bali! It was really nice! The driver was punctual, staff at spa were all very friendly. The spa treatment was outstanding! It was really nice! The driver was punctual, staff at spa were all very friendly. The spa treatment was outstanding!